Bikeability is today’s cycle training programme replacing cycling proficiency. Bikeability gives everyone the skills and confidence for all kinds of cycling. There are three Bikeability levels, each designed to improve cycling skills, no matter what is known already. Levels 1, 2 and 3 take riders from the basics of balance and control, all the way to planning and making an independent journey on busier roads. All our training is carried out by qualified National Standard Instructors who are DBS checked and employed by South Gloucestershire Council Road Safety Team. Level 1 riders learn to control and master their bikes in a space away from traffic such as a playground or closed car park. Riders will usually be trained in a group. Session time 2 hours. Level 2 takes place on local streets, giving riders a real cycling experience. Riders learn how to deal with traffic on short journeys. Session time 7.5 hours. Adult Training If you are New or returning to cycling and would like help to gain confidence we can provide 1 to 1 or group tuition. First session is free and thereafter £20 per hour. Bikeability Balance to equip trainees with balance and co-ordination skills. Bikeability Learn to Ride for children who are unable to cycle, including older children and adults who have never mastered the skill. For School Year 3 and above. 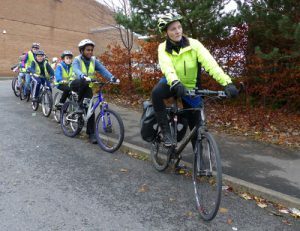 Bikeability Ride aimed at secondary school children who have taken part in level 2 upwards with an aim to incorporate quiet roads and shared paths which young people are likely to use when getting about in their area, ride distance approximately 5 – 7miles – Session 90 minutes. Bikeability Transition provides students moving from primary to secondary school with route planning skills to plan and make a safe cycle ride to their new school. Bikeability Recycle we refurbish unwanted bikes and look to re-home them with children who don’t have access to a roadworthy bike. At present we have a range of bikes in different sizes. Bikeability Fix teaches riders how to perform basic maintenance on their bikes – Session 90 minutes.